Russia and China suffered the worst casualties during World War II and thus have the greatest reasons to oppose attempts to rehabilitate Nazism and militarism, Russian President Vladimir Putin said after meeting China’s President Xi Jinping. Xi arrived in Moscow to meet his Russian counterpart with an array of economic deals to sign. The Chinese leader will also take part in the V-Day celebration in Moscow on Saturday. 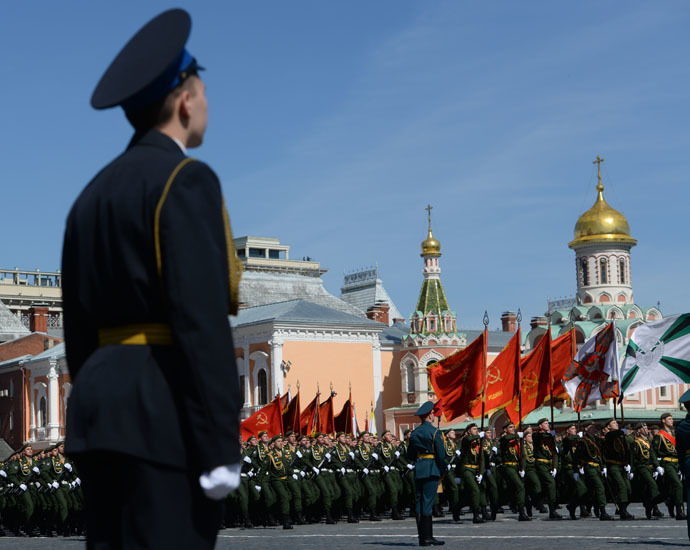 A military parade demonstrating brand new Russian weapons is part of the festivities to mark the 70th anniversary of the victory over Nazi Germany. “Tomorrow with other world leaders we will take part in celebration of the 70th anniversary of the [Soviet] victory in World War II, and in September in Beijing we will mark the end of the World War II. We will commemorate those who stood side by side against the militaristic Japan,” Putin said. Xi, who personally invited the Russian president to attend the September 3 commemoration in China, said the event is meant “to honor the memory of the lost heroes” and “not allow the tragic history of that war repeat again, to create world peace together. “The hard lessons of the World War II say that coexistence of humanity is not ruled by the law of the jungle. The politics of peace is the exact opposite of the aggressive hegemonic politics of force. The path of human development does not lay in the principle ‘the winner takes it all,’ not in zero-sum games,” he added. China and Russia are strengthening cooperation amid a Washington-led effort to isolate Moscow over its position in the Ukrainian crisis. Russia sees China as a major importer of energy in decades to come. The two countries also want to develop ties in defense production, military training, fighting against extremism and international crime, cultural and scientific collaboration.